Nicole is a FitGrid Ninja and certified MINDBODY Expert who has worked directly with thousands of clients nationally and internationally in verticals such as yoga, Pilates, wellness and barre fitness. Her clients - which include multi - location businesses such as Bikram Yoga, Bar Method, core power Yoga, Moksha Yoga, and Dailey Method—have achieved up to 125% revenue growth year over year, through her specific teaching methods on business best practices. Nt Etuk is Founder of FitGrid, which builds community management software forboutique fitness studios. Nt is also Founder of DimensionU, creator of 3D multi-playereducational videogames. Prior to becoming an entrepreneur Nt worked with Citigroupand McKinsey. Nt is a member of Crain’s 2013 40 Under 40, a 2012 World EconomicForum Technology Pioneer, a 2010 Henry Crown Fellow at The Aspen Institute, and wasselected by Technology & Learning as one of the 30 Future Leaders of EducationTechnology. Nt holds a BS in Electrical Engineering from Cornell, and an MBA fromColumbia Business School. What if you could increase studio revenue by simply allowing your instructors to create a more personal connection with new clients? It would be a worthwhile endeavor as almost 99% of class-based business owners struggle with an industry standard new client loss of 50% or more! This means that for every 2 new clients who walk in the door, 1 leaves....and never comes back. When presented with this information, it’s normal to blame the competition, location, class type or other factors contributing to this alarming loss. Though possible, more often than not, it’s the lack of personal connection the new client receives on the first visit to a class-based business. Because classes are made up of large groups of clients, it’s very easy for new clients to be completely overlooked by instructors. Instructors, however, are in a position of tremendous influence when it comes to new and existing client retention, as a word of encouragement, using names, giving a helpful correction, or remembering a client's birthday is one more reason clients will return to your studio when competition opens up 2 doors down offering free classes! When there is a lack of connection between instructor and new client, in conjunction to the inherent awkwardness and confusion that accompanies being “new” to any kind of physical exercise or practice, 50-70% attrition ensues. If that isn’t enough fuel to get your instructors connecting more effectively, consider that for every new client lost, revenue decreases exponentially overall. The fact is that every new client represents unlimited revenue potential. That said, it behooves every entrepreneur to keep as many as possible. This strategy alone is by far the simplest, and most effective way to increase revenue. This is the tool every studio owner needs to facilitate the personal connection between instructor and new client through simple, thoughtful and personal follow up via email. The Studio Return Rate metric (see image below) is specifically meaningful to business owners, as it shows which instructor is best at getting new clients to return the studio as a whole. For example, a Studio Return Rate metric of 60% means that of the 1st time clients to the studio who saw that instructor on their first visit, 60% of them returned to ANY instructor within the following 30 days. As this metric increases, it means that the business has increased attendance as well as revenue, and has avoided the dreaded 50% attrition rate. What does this really mean? It means that because instructors are empowered to check in with new clients right after their first class, acknowledge them personally, and learn their names, the return rate improves, thereby increasing the likelihood of future revenue. New clients who return after the first visit are more likely to purchase class cards and membership. 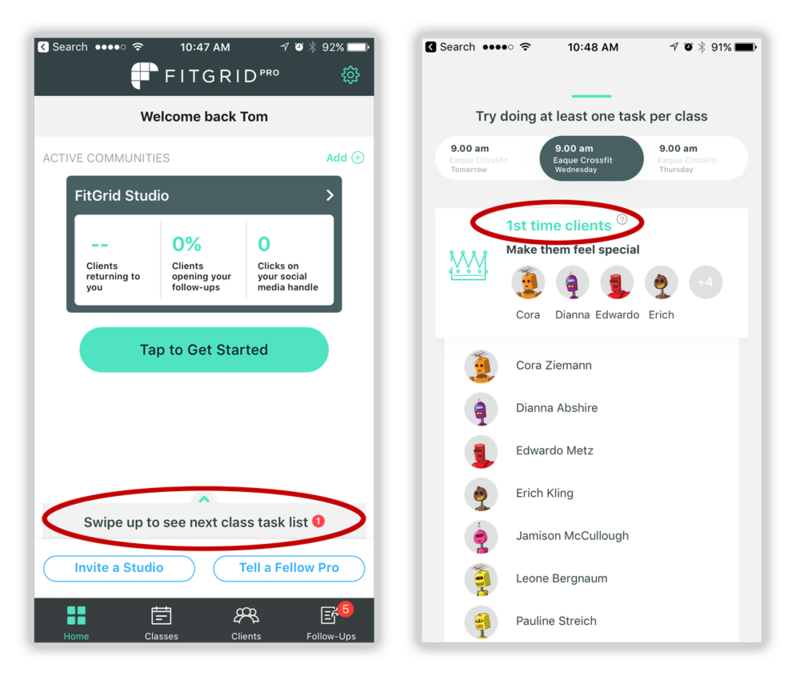 FitGrid makes the Studio Return Rate visual and easy to understand and also provides follow-up metrics that show how often instructors engage with clients. All of this suggests the opportunity to create an incentive program to drive up new client retention. Using the FitGrid platform, create a program to increase Studio Return Rate. Create a goal for Studio Return Rate that is 20% or more of what your top 3 instructor metrics are. Bonus the top 3 instructors at $50 - $100 if they reach the goal. Select the top 3 instructors and have them train others on how to use FitGrid to retain more clients. Creating consistent and better new client connection to instructors is one of the simplest, most effective, and inexpensive ways to boost your revenue, increase loyalty, and pack your classes. If you begin this program in October (for example), you will not see the first effects of this in the Instructor Reports until the November Report. 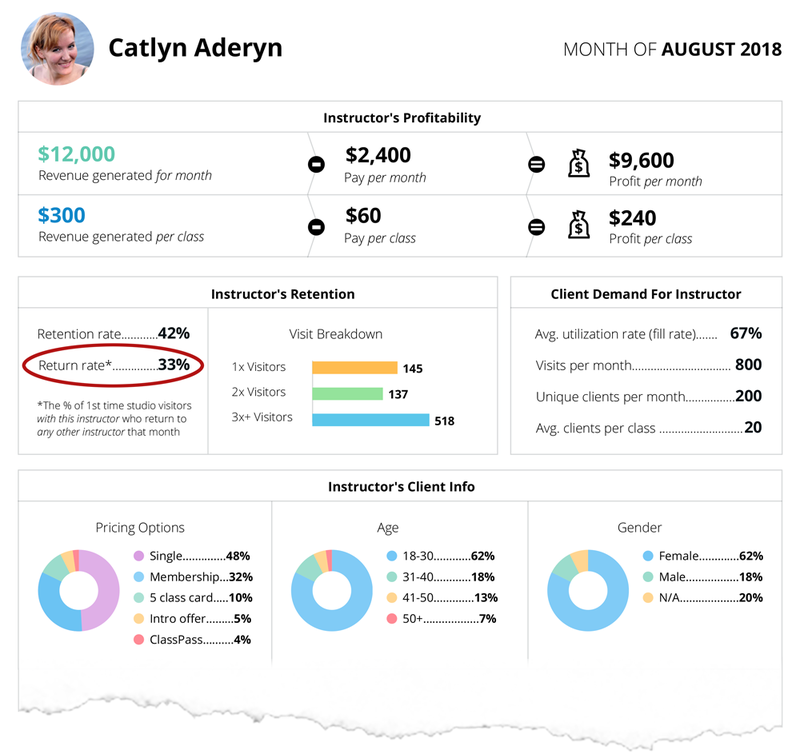 This is because The Studio Return Rate looks at clients who were 1st-time-to-studio and who visited that particular instructor in the month BEFORE the report (so July in the example Instructor Report image above). It then finds the % of those people who returned within 30 days. For example, the 33% above means 33% of the 1st-time-to-studio clients who came in July, to Caitlyn, came back within 30 days to any instructor within the studio. So someone who came in first on July 22 had until August 22 to return to be counted. Connect to Clients. Train Your Instructors. Boost Revenue.